Instagram is one of our favourite places to share all things beauty. 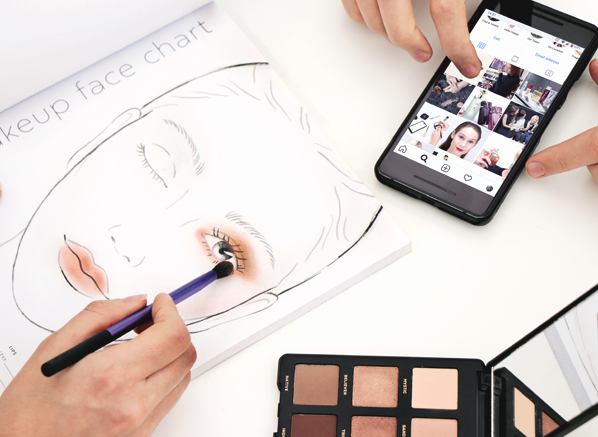 It’s full of amazing, like-minded makeup addicts with a keen interest in trending beauty matters, so where better than there to find out some tips and tricks to optimise our routines? @mackieali Have a capsule make up wardrobe. Cutting down on decisions saves time. @millyyma Investing in a good brush for applying eyeshadow makes it much easier and quicker to get a flawless, blended look. @tatiana.francisco1 Dry skin like mine loves cream products, so my makeup consists of cream products only and lots of blending! @mrspixelwife Use under eye brightener as a highlighter on cheeks too. One less product to buy! to bring the look together. I’m a nurse and a mum so early morning and complicated makeup routines don’t work! just dot on a high-quality concealer to the base of the nose, under the eyes and over any blemishes and quickly blend. @tisay87 Mix your highlighter with your foundation! @lucyrose_proartist Lipstick is a great multi-use product! Saves time and I’ve recommended it to all my mummy friends!!! Use your chosen lip colour on the cheeks and eyes to harmonise your overall look and save time! For the best beauty newness and news, click here to join the #Escentual Instagram community. This entry was posted on Thursday, October 18th, 2018 at 5:48 pm and is filed under Hints & Tips, Lifestyle, Make-up, Tried & Tested. You can follow any responses to this entry through the RSS 2.0 feed. You can skip to the end and leave a response. Pinging is currently not allowed.